It's been 4 weeks since the first day of school. The first week of school means Tech Camp! This was our second year to hold Tech Camp. We have 4 grade levels in our middle school so Tech Camp starts on Tuesday with 5th grade. Then 6th grade on Wednesday, 7th grade on Thursday, and 8th grade on Friday. Last year, each grade level had the same lessons, except for the Digital Citizenship lessons. I differentiated those right off the bat. So, I had to write new lessons for 6th-8th grades for Google Accounts, Copyright, and Expectations. I left the Terminology lesson the same. At ISTE a speaker mentioned a study that showed that something like 53% of Americans think that HTML is a sexually transmitted disease (I wish I had a citation for this). I told the kids I have them for 4 years. They are going know these words before they leave me! My favorite new lesson is for 6th grade Copyright. 6th graders need to begin created Works Cited pages. So, we wanted to introduce citations. Ta da da! Human Citations. Each group received a book, magazine article, webpage, fill-in-the-blank pages, and punctuation. The teacher posted a "How to create a citation" page on the board. Students worked together to find the information needed for each type of citation. Then they lined up to make a Human Citation!! Once again this year, Edmodo caused the most headaches during Tech Camp. Edmodo itself didn't cause any trouble at all, it was all user error. We have the students join each of their classes. So, I write their class codes on the schedule. This takes forever! But it's worth it to buy the teachers time when they get ready to start Edmodo. The other problem was that some 5th graders already had Edmodo accounts from 3rd grade. The problem was that no one remembered the passwords. Thankfully, the 3rd grade teacher archived the classes. I was able to unarchive her classes and reset their passwords. I realized this Monday afternoon so I was able to take care of it before the 5th graders started Tech Camp on Tuesday. Tuesday was, hands down, the most stressful day. This is to be expected. The 5th graders are new to the building and new to all the technology. I missed a few kiddos on the Edmodo unarchive/reset. And my new student's emails were a little wonky. When I create new emails I assign the password we want them to have. Out of nowhere, Google started asking (forcing) them to change their password the first time they logged in. As a result, I had 5-10 students come into my session (I teach the portfolio session) to get fixed up. The excellent improvement this year was that I now have Tech Aides. 3 8th graders who come to me 1st, 6th & 7th periods to help out. They really helped out! I was still up very late each night writing in Edmodo codes but I could have them do some housekeeping things each day. In the weeks following Tech Camp, Edmodo issues continued to dominate my days. I met with each 6th grader one day to make sure they typed in their school email correctly. I had several 8th graders who didn't use their school email and couldn't get into Edmodo. Several students changed their passwords then couldn't remember what they changed it to (which is why I ask them not to change the password I give them). Some kids couldn't get in when it was time to work in Edmodo so they somehow created Teacher accounts. I think I have handled all these issues and things are slowing down. I've had a chance to reflect and do some math. 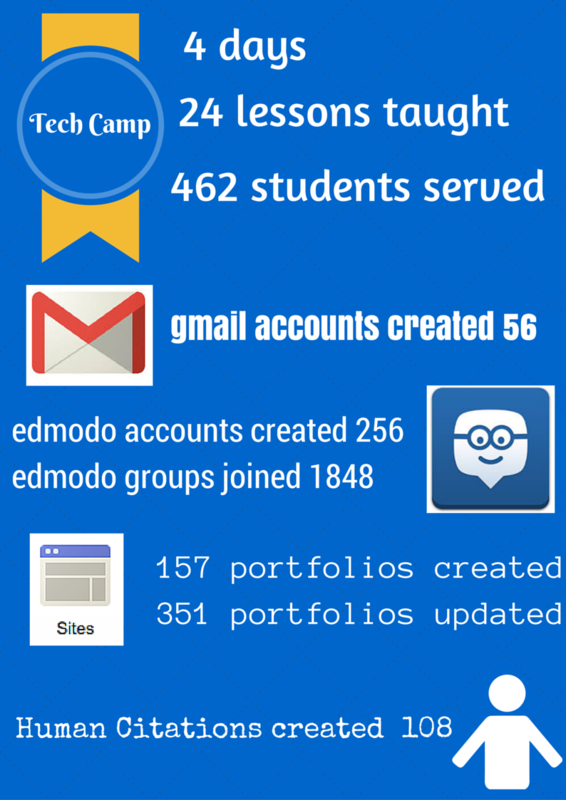 I give you: Tech Camp by the numbers. If you're interested in hosting a Tech Camp, you can see all the lessons here. Let me know if you have any questions! I am: second. a writer. a reader. thinker of big thoughts. technology specialist.